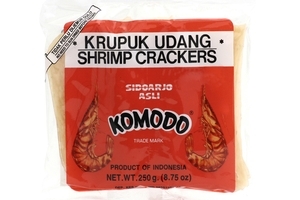 Komodo Large Shrimp Cracker (Krupuk Udang Sedang) in 8.75oz (250g) Pack. Estimated size 5x8cm each. Un cooked - Frying Required. Comodo Shrimp crackers (Kerupuk) taste great by themselves or with your favorite chip dip. Perfect as a snack or as an appertiser at lunch time, parties or picnics. Komodo Shrimp Crackers require frying (preferably in a deep fryer) until golden in color, it expands to about 3 times its original size. Kerupuk Udang Kecil Asli Sidoarjo Cap Komodo. Tidak Perlu Di Jemur, bisa langsung di goreng. Mengembang 3 kali ukuran sebelum di goreng. Product of Indonesia. Halal Certified حلال . I purchased and consume this Shrimp Crackers for more than 3 years now. All you have to do is deep fried it on hot oil for a few minutes. Pick it up, put it on serving plate with paper towel (to absorb the excess oil). Let it cool for about 15 minutes, and enjoy. I usually eat this every time I make Rawon (search for the instant spice to make Rawon (beef stew) in this website too. It is very delicious when the taste of the Rawon soup mixed with this snack. It is more like chips than crackers actually (because you gotta fry it first). It does not taste too fishy only a slight shrimp flavor.